batam activity: January Promo Henry Adams at the Mega Mall Batam Center "Buy Two Get One Free"
January Promo Henry Adams at the Mega Mall Batam Center "Buy Two Get One Free"
"In 2010, we conducted some promo in the framework is still welcoming atmosphere of the new year, new clothes with a promo price of a completely new and profitable for the community / customers" says July. 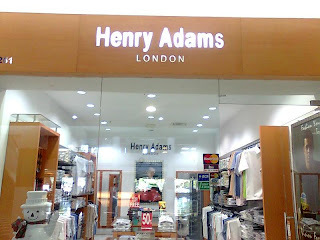 Furthermore, he added, was Henry Adams in January MMBC also launched a series of 50 per cent discount to the latest collection of formal menswear. In terms of accomplishments achieved by the sales area for the years 2009 batam ago, June explained, so many dynamics and accompanying events and a number have been affecting the performance and sales achievements. "In November last year, we are good sales in December but we are a little bit down because of the retail giant is doing a sale right in front of our booth, it is the business side is very detrimental, not only for Henry Adam, but also for all the existing tenant in the area "said July. Meanwhile, when asked about the target set by Henry Adams for a regional scale in the Riau Islands first quartal reached plus minus 20 percent. This figure was encouraged by the way is always updating various special programs either discount or other price reductions. For this first quartal setting soft colors decorate the windows back Henry Adams, the motive is still dominating the line of new series of arrival items currently on display at the Henry Adams. "This year, the motive and soft color line is still a favorite" said July ended.